Let me say two things to start this off: Wow! and....eh? Let me explain. First off, this flavor scooped easy, but I recommend letting it melt a few more minutes because when you eat it, you're gonna think "WOW that's smooth". People have been saying I need to try some of the others Five flavors and now I see why. This is just top notch quality ice cream. It scoops perfectly with the spoon and just flows so well when you bite into it. Am I exaggerating? I don't think so, I try hard not to..but wow, just wow, impressive. Ok, now that's get back to the "eh?". Not sure how clear it is from the picture, but when you crack open this container, you will be shocked by the number of vanilla bean flakes everywhere. I was so impressed that I tried taking a big whiff of a sniff thinking I was going to be overwhelmed with pure vanilla fumes. Well, I wasn't, but I had to try. The specks really are impressive. They trigger that little mouthwatering part of your brain that tells you to start getting giddy with the thoughts of how wonderfully vanilla this would be. Wow again, because that just sounds weird. How can you be impressed with the most basic of flavors? easy, when you take that flavor and you hit a grand slam with it. But is this a grand slam? I'm not sure, I'm tempted to say yes, but I think we need a gourmet chef to chime in...do we have any in the audience? I ask because sometimes the vanilla, it, well, it hits me as like a strange spicy cinnamon flavor. It's the weirdest thing. I desperately want to love this flavor, but then it hits me. Is true vanilla spicy? have I been thrown off by a lifetime of mild vanilla extract? I still finished my serving and had to resist the urge to try more. Overall, it's still a very impressive product, but I'm confused. I've never cooked with vanilla beans so I don't know if it's suppose to taste like this. I think it's on purpose and that my taste buds have never actually known what vanilla bean truly is. It's funny how these five flavors are each so unique. It's more than just being simple, they're going in for a true taste. the milk chocolate was really about pure cocoa, and here vanilla is really about the bean. Very interesting HD, very interesting indeed. On Second Scoop: I think I'm getting use to it, but it's still weird...and still amazingly creamery, must be the ingredient combo. I think I'm going to have to pick up some of their regular vanilla and give it a try. Update: Ahhh, ok, call me unedgeamacated 'cuz apparently after many years on this planet, I finally now know what a true vanilla bean product tastes like. 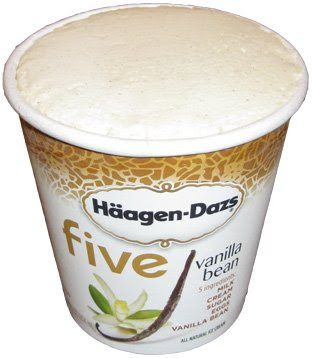 If you don't know what I mean, pick up some Vanilla Bean five and you'll know what I mean.